I went with my French girlfriend from London to Toronto on a Boeing 747 and returned on the Concorde. This was the longest flight the Concorde could do on its limited fuel tank. We stayed at a luxury hotel in Toronto and the trip included lunches and diners at hot places around Toronto, including the CN tower and a helicopter flight around Niagara Falls. Normally the peak of a trip is not going home, but this was different since we were flying home on the Concorde. After we were seated in the plane and waiting on the runway for takeoff, the captain told us that he could not ignite the engine, but needed outside assistance for this. 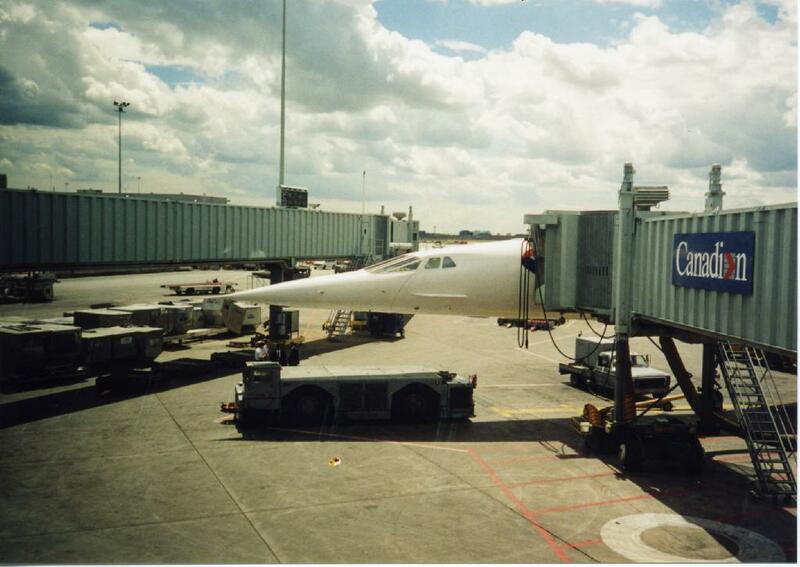 Dont know if that was the case for all Concorde flights. He also told us how bad the Concorde was to fly at slow speed, so just after takeoff we would climb high and fast and then as we we flying over Newfoundland we broke the sound barrier, which to much surprice was effortless and unnoticeable. We were drinking champagne and you could not see of feel anything differently, except for a gentle push back into the seat as the captain turned on the after burner ....... and of course you could also see it on the display. And now there is something called the "10 mile high club"
The ride was quite smooth, but when we touch down the camera that I held in my hand flew forward as the Concorde was braking ...... so it is not only the engines, but also the brakes that is upgraded on this plane. Total prize £2000 pr. person. She found this package and booked it for us .......... I don't remember what agency she used, but today the prize just sound ridiculously low. I cannot read the stamp in the passport acurately, but I think it was 5 days and that we stayed in Toronto at Sheraton Hotel. 1 - Keep away from people who try to belittle your ambitions. Small people always do that, but the really great make you feel that you, too, can become great. 2 - There are only two ways of telling the complete truth--anonymously and posthumously. 3 - Every great advance in natural knowledge has involved the absolute rejection of authority. 4 - Nobody in life gets exactly what they thought they were going to get. But if you work really hard and you’re kind, amazing things will happen.